Almost two decades ago, when the internet was taking its baby steps in the Indian online space, various Indian e-commerce companies attempted their first flight. Most of them failed to survive and those who survived have become the poster boys of the ecommerce industry today. During 199596 we saw advent of internet through dial up in metro cities and that’s where the ecommerce journey began through some B2B directories, on-job portals and matrimonial sites. Since then e-commerce has seen many ups and downs, however with every such movement, e-commerce has been coming out stronger. Thanks to ever increasing penetration and adoption of internet and the over all ecosystem for ecommerce falling in place, last 5-6 years can simply be defined as the best years for the industry. Though not many people will be able to see a direct link between Low cost carriers ( LCC) from aviation industry and growth in e-commerce sector, I strongly believe that LCCs did have a hand in pushing ecommerce to a high level growth. LCCs requirement to reach the masses while keeping their operations cost low, forced them to push on-line ticket booking directly to customer (B2C). It also created humungous opportunities for various travel linked intermediaries (hotel, holidays, events etc) to start on-line business (B2B). This was the beginning for the story of e-commerce to begin. The e-commerce that was restricted to jobs and ticketing till 2007 has exploded since then. Starting from apparels, fashion accessories, shoes, electronics, real estate, groceries, vegetables, medicine and pharmaceuticals, education, insurance to many other goods and services in B2C space and procurement of every raw material and other commodities for any business in B2B arena , ecommerce has become omni-present. The biggest game changer for e-commerce has been internet. We had over 5 million internet users in 2000. That count has gone over 200 million in 2014 and is expected to reach over 500 million by 2018. Today India ranks third in the world, behind only China and USA in the number of internet users. With mobile penetration increasing , drop in prices of smart phones and tablets , dropping data prices, the internet growth story in India is led by mobile internet. Along with increasing internet penetration the average time being spent by a customer on the internet has gone up to 30 hours per user per month. The annual disposable income that was USD 2600 per household in 2005 is expected to reach USD 3800 by 2015. The growth in the size of middle class to upper class will be more than 3 times in the same period. This is changing the consumption pattern between discretionary and non-discretionary spends. So far e-commerce spends are more towards discretionary (fashion, electronics, etc. ), however, we are seeing significant improvement with people moving for their non-discretionary (groceries, essentials) to e-commerce. The consistent investments coming in to e-commerce during last decade has helped this sector immensely. The other heartening element is that these investments are happening across ecommerce verticals. Various angel funds and Silicon Valley funding has been another good fund support for various new ecommerce ventures. Ecommerce has gone beyond generating employment; it has given a boost to entrepreneurship among the youth with almost 63 per cent of e-commerce ventures started by first time entrepreneurs in 2013-14. Though e-commerce has been growing at a healthy rate, there are equally high number of challenges the industry has been facing. Though internet has helped e-commerce to take a quantum jump the internet is also the biggest road block for e-commerce to grow at par with some of the other developing economies. 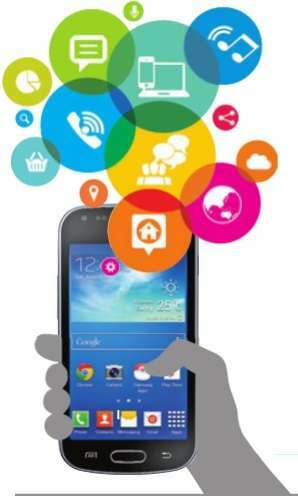 Out of 40 million MSMEs and SMEs, only a small universe of 1million has access to internet. The other impediment is quality of internet. We have not seen any improvement on internet speed front (average speed remains in the range of 800kbps). Similarly broadband speed is equally challenging in comparison to some of the other countries with average speed of less than 1mbps. The current, complicated tax structure (CST, VAT etc) is one of the biggest impediments in ecommerce growth. Roll out of GST is imminent now for ecommerce to grow at high pace. With new government assuming the charge, it is expected that GST will see the light now very soon. One of the biggest challenge e-retail partners face is logistics and warehousing. As last mile delivery is the first physical customer interface for most of the ecommerce ventures, it has to deliver a delight to customers. Adoption of technology, timely delivery, quality handling of return orders, CoD, etc., are other hygiene parameters. With lot of investments coming in we are seeing significant improvement in this sector. With FDI expected to find its way this sector should see maximum improvement. Absence of any law for internet and e-commerce related business is becoming another challenge for the industry. The archaic law IT Act 2000 governs the ecommerce as well. With logistics, banking and various other support industries becoming the back bone of e-commerce, there needs to be a comprehensive law to protect the rights of suppliers and buyers both. The other challenge is low customer loyalty. Almost all the e-retail business use deep discount as the crowd puller to their sites which is not a sustainable model in the long run. E-retailers need to move away from such business model and be innovative in creating their businesses. Some of the eretailers have developed strong private labels, which is helping to create healthy margins for their business thus creating sustainable businesses. Various loyalty programs initiated by eretailers are also creating customer stickiness. Use of data, analytics and social media is helping e-retailers to offer customized solutions rather than en-mass discounting. Lack of skilled and e-commerce trained manpower is another problem in the industry. Since there are no formal courses on e-commerce most of the employees are being trained on the job. This is one of the reasons for high attrition and has cost implications. Despite these challenges ecommerce has been growing at a cumulative average growth rate (CAGR) of 54 per cent over the last five years. Currently a $16 billion sector, the e-commerce space is expected to touch almost $50 billion by 2020. India’s e-commerce market currently resembles the Chinese e-commerce model a decade ago. India’s industry is all set to take next leap. With high pace changes happening in e-commerce eco-system, FDIs coming through, changing customer behavior, dual income families, paucity of time, etc., are early indicators that e-commerce, which is contributing 4 per cent to the GDP, will soon be contributing in double digits. The number of transacting people, average time spent on on-line sites, the average ticket size of purchase, etc., all of them increasing is a healthy sign. 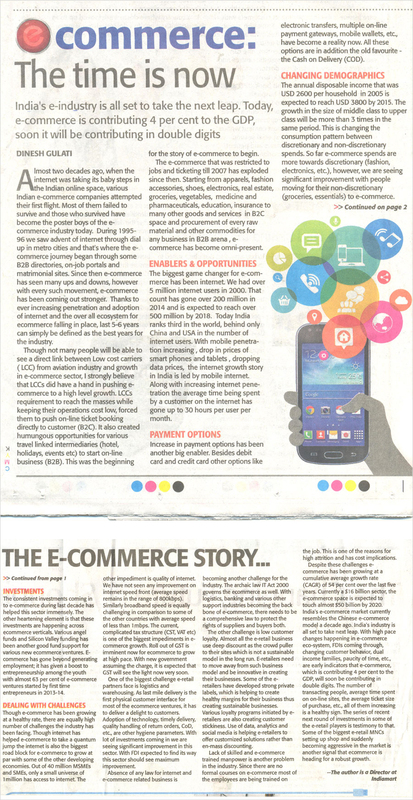 The series of recent next round of investments in some of the e-retail players is testimony to that. Some of the biggest e-retail MNCs setting up shop and suddenly becoming aggressive in the market is another signal that ecommerce is heading for a robust growth.